So you've got this whole chicken that you've roasted with all kinds of delightful spices. You carve up a breast, and push the skin to the side because it hasn't been cooked right and is gelatinous and chewy, or because of some misguided conviction left over from the '90s that it's unhealthy, or maybe because you never cooked it with the skin on to begin with, because the recipe stupidly instructed you to "remove and discard chicken skins." But you're a fool if you don't make crazy-delicious chicken skin a priority in your poultry dishes. 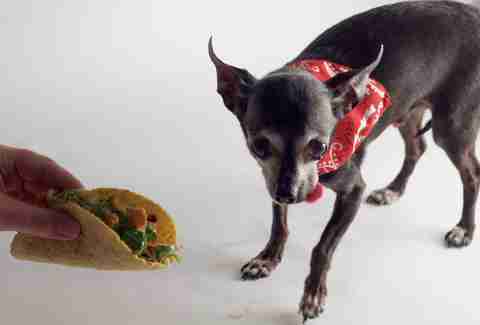 So allow me to first convince you why you should eat the stuff, and then explain how to eat the stuff (hint: crispy, fatty crackling tacos are involved). Chicken meat tastes good. We all can agree on that. 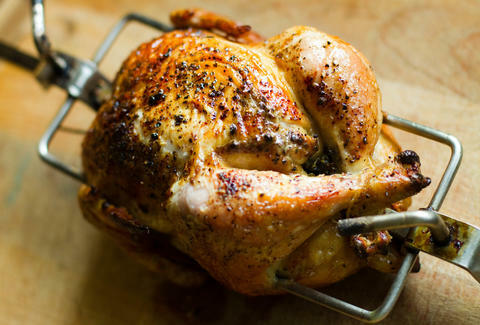 According to the National Chicken Counsel each American ate an estimated 90.1lbs of chicken last year. 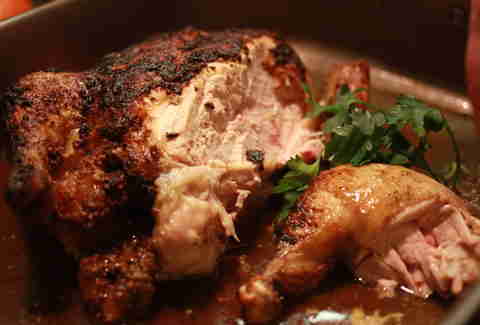 But chicken -- even the flavorful thighs -- usually needs a little help. This is why it's often marinated or seasoned with additional spices. Chicken skin, on the other hand, is concentrated chicken flavor, like the chicken knew its meat was a little underwhelming so it kindly wrapped itself in its own bacon. The fastest, easiest way to elevate the chicken flavor in a dish is to, obviously, include the most intensely flavorful part of the chicken. So whether you’re eating chicken that's been roasted with the skin on or removing the skin and cooking it separately to make cracklings, you're going to want to get it crispy-crunchy. After a chicken is dispatched in the slaughterhouse, it’s in everyone’s best interest to get that warm bird cooled down before bacteria has an opportunity to spoil it. And the easiest, cheapest way to do this is to dunk it in really cold water. The problem is that chickens absorb some of that water. This is why most supermarket birds are marked with “contains 5% by weight water” or something similar. Air chilled birds skip the bath and are instead chilled in a cold room. This still narcs hard on bacteria’s party, but doesn’t leave you with a waterlogged bird. The downside is it’s more difficult and costly to do, and so buying and air chilled bird is a little more expensive. You can find air-chilled birds at most premium supermarkets, from good butchers, or order online from Mary’s. All you have to do is pat the chicken dry with paper towels and then set it on a wire rack above a pan in the fridge. Leave it there for a day. The cool, dry air of the fridge will pull moisture from the chicken skin. And don't worry about the meat drying out -- the skin will keep moisture locked where it should be. Anything where the temperature is hotter than where water can still be water (212F for all you communications majors out there) is a dry cooking environment. Ideal candidates for this are: an oven, a skillet, a grill, and a deep fryer. Keep in mind, though, that rendered fat (which is fat that's been cooked down) conducts heat better than not-fat, and heat kicks water out of the skin. So make sure you give your chicken a modest fatty rub-down before cooking it. Canola oil, olive oil, schmaltz (rendered chicken fat), or lard are all ideal here. Butter is fine but the milk solids can leave the skin a little splotchy. It’s best to finish with butter rather than start with it. So, we’ve talked about how to make skin crispy when it’s on the bird, but what about all those recipes that don’t call for the skin at all? 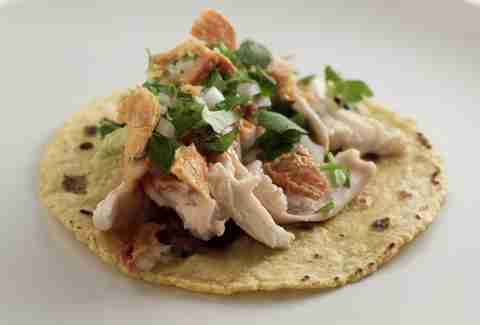 For example, a classic chicken taco recipe (which you'll find below!) calls for poaching a chicken whole, letting it cool in the broth, removing and discarding the skin, and shredding the meat. Same for chicken salad, stir fry, and any time you’re dealing with bits and pieces of chicken rather than the whole thing. Crackling bits are pure chicken flavor bombs. The answer here is simple: remove the skin before cooking and crisp the skin separately to make crunchy, intensely flavorful chicken cracklings that will boost the overall chicken flavor of any dish. My favorite thing to do is to mince them up and fold them back into a cooked chicken dish, like enchiladas, chicken salad, chicken BBQ, or stir fry. Nestled in with the rest of the meat, the crackling bits are pure chicken flavor bombs that heighten a dish's flavor without adding extra, distracting ingredients. First, remove the chicken skin. This is as simple as sliding a gloved hand beneath the skin to separate it from the meat, then pulling it off. Next, scrape excessive fat from the underside of the skin, because this unrendered fat is moisture, and moisture is the enemy. Then, pat it dry with a paper towel. Get a sheet pan. 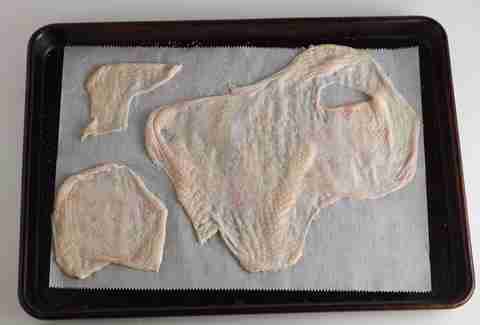 Place some parchment paper on it and spread the chicken skins out flat on that. Season with salt. Cover everything with another piece of parchment and then another pan. The second pan here keeps the skins from curling up as they cook. To really ensure this doesn’t happen, put a skillet or something oven safe and heavy on top of the whole operation. Put all that in the oven at 375 degrees for about 20 minutes or until crispy. Immediately set crispy skins on paper towels to drain any rendered fat. This last step will ensure that they taste like chicken and not chicken grease. Mixing the cracklings back into the meat is just one option of many. Try seasoning them with spices (your favorite BBQ rub, perhaps?) and eating them alone as a tasty snack. Or, you can crumble them up and sauté them in a little butter with breadcrumbs for a flavor packed crunchy topping for mac and cheese, green beans, salads, pastas, or frittata. You see, not eating the crazy delicious skin of a chicken is like picking all the marshmallows out of a bowl of Lucky Charms. So start roasting the bird right and making chicken cracklings -- see for yourself just how delicious and versatile they can be. 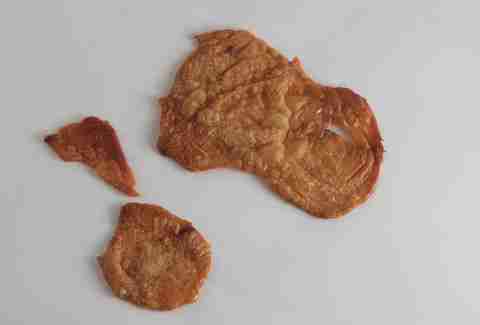 Nearly anything can be made better with some chicken skins, except for the trash. So please stop putting the best part of your dinner there! 1 whole 3-4lb chicken, cut into 4 pieces (2 breasts, 2 thighs/legs), carcass and wings reserved, skin removed and saved. If you planned one day or even part of a day in advance, put the carcass and wings in a pot with the onion, bay leaves, garlic, and peppercorns. Cover with cold water, bring to boil, reduce to a simmer, and cook for 3-4 hours, or however long you have. Strain, reserve. Stock will keep 5 days in the fridge. If you don’t have time to make stock, freeze the carcass and wings for another time, and don’t fret it. Your next batch of soup will thank you. To make the crispy chicken skin, cut/scrape off as much fat as you can from the skins, then lay them flat on a parchment lined sheet pan. Place another piece of parchment on top of the skins and then another sheet pan on this. The top sheet pan will keep the skins from curling. Cook in a 375F oven until crispy, about 25 minutes. When done, place on paper towels and reserve. Meanwhile, place the breast, thighs, and legs in a pot and cover with cold stock or water. If using water, now’s the time to add the onion, bay leaves, garlic, and peppercorns. Turn the heat to medium-high and slowly bring to a simmer. Don’t let the water boil. After 15 minutes, use a digital meat thermometer to test the temp of the thickest part of the breasts. When they reach 150F, pull them from the water and let cool on a cutting board. Continue to cook the thighs until they reach an internal temperature of 175F or until you get impatient. Remove and let cool on a cutting board. Turn the heat under the pot to high and reduce the stock by at least half. Strain and reserve. Keep the pot around and don’t bother cleaning it yet. When the chicken has cooled, chop it up with a knife or shred it with your hands. Add it to the pot you didn’t clean and season it with a good pinch of salt and cracked black pepper. Then add a ladleful of the reduced cooking broth. The idea here is to add just enough broth to keep things from drying out. If you add too much you’ll end up with a really great chicken soup that you can just pretend you intended this whole time to make. Right before serving, turn the heat on under the pot and warm up the chicken. Don’t boil it or else you’ll dry out the breast meat that you already did such a great job not overcooking. Serve on fresh, warm tortillas, with a spoonful of your favorite salsa, chopped cilantro and white onion, and a sprinkling of crumbled crispy chicken skin. Spritz with lime and party. Brett Adams is a bartender at the Multnomah Whiskey Library, in Portland, OR, and a taco advocate. Follow him at @4chordkitchen or Four Chord Kitchen.